NYPL Time Traveller is an app that alerts Foursquare users whenever they check in near historical sites in New York City and lets users view photos. The app was created at the New York Public Library Historical Geolocation Hackathon by Jeff Larson, Mike Tigas, Sisi Wei and Ashley Williams, and uses images from the Photographic Views of New York City collection that show historical sites in NYC from the 1870s to 1970s. 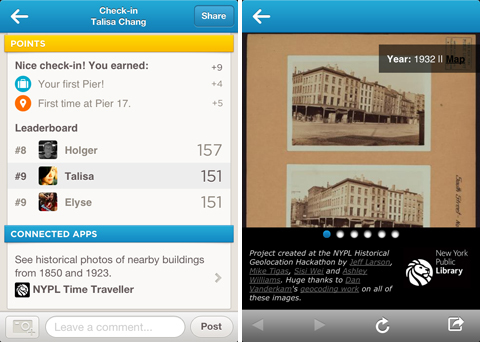 Foursquare users can connect their accounts to start using the app at the NYPL Time Traveller website.